The "Church" of Scientology is extraordinarily anti-psychiatry, up to the point of blaming them for most of mankind's ills. Their written stated goal is to replace psychiatry with their own unscientific methods known as Dianetics and Scientology. 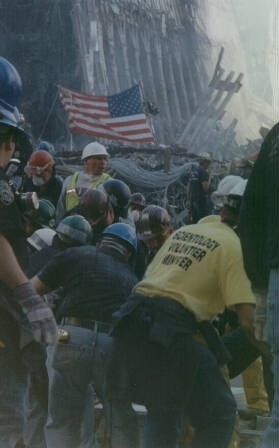 After the World Trade Center terrorist attack, mental health professionals were in the area attempting to help the victims and witnesses to the tragedy. One Scientology front group, the Way to Happiness International, immediately sent out an email asking for funds to distribute their small bizarre handbook on "morals" to be distributed in New York City and Washington, D.C. An email from the International Hubbard Ecclesiastical League of Pastors (IHELP) states that the Scientologists on the scene in New York City attempted to prevent the real mental health professionals from helping others so that the Scientologists could go instead with their unscientific quack methods. Besides this unfathomable activity, Scientology also managed to have Fox TV News scroll "National Mental Health Assistance 800-FOR-TRUTH" which is a Scientology promotional number. This scrolling message ran on Fox TV for several hours, including during the National Cathedral service in Washington DC that was broadcast live. After dozens of people contacted Fox TV about this outrage, Fox TV finally took down the scrolled phone number. The St. Petersburg Times wrote a good article about this on September 15. What kind of organization would stop mental health professionals from helping victims of the World Trade Center attack? What kind of organization would pretend to be mental health professionals during such a disaster, when they have no such credentials? How did they block the real professionals from helping (see here for a possible example, where Scientology attacked picketers)? Why does this organization have tax-exempt status in the United States? On September 17 the National Mental Health Association sent a press release warning of Scientology's actions in New York.